Summertime is traditionally when the movie industry doles out its biggest hitters, but it’s also when music’s heavyweights hit the road. In stark contrast to most of the 1990s, the large summer festival tours that once dominated the tour landscape, like the Lilith Fair, H.O.R.D.E. and Lollapalooza, are gone. Those tours first appeared out of economic need: In the early ’90s and in the midst of a recesssion, who was going to shell out big bucks for a concert? The strategy of including several acts on the bill drew larger audiences to the event. But like the economy and musical tastes, things have changed. This year, only a few package tours, like Ozzfest, the Up in Smoke Tour and the Warped Tour, are still around. These tours have stayed together primarily because they’re marketed to a particular subculture that is well established. Fresh off his multi-Grammy-winning, multi-platinum and multi-guest album, “Supernatural,” guitarist Carlos Santana and the latest incarnation of his band will bring their free-form show to all those record buyers. 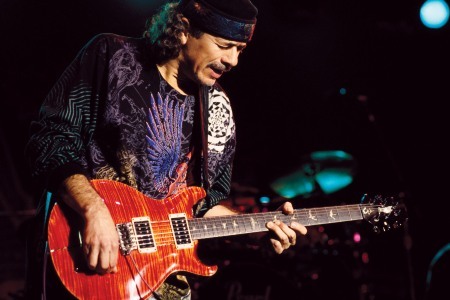 Santana has been known to play songs from throughout his 30-year career in concert, and there’s little chance that this sojourn will feature only “Supernatural” tunes. Don’t you think he’s probably sick of hearing “Smooth” too? Pop sensation Macy Gray and ex-House of Pain rapper Everlast will open. July 20: West Palm Beach, Fla.
July 26: Virginia Beach, Va.
Aug. 19: Tinley Park, Ill.
Doesn’t this tour look like ’80s heaven? are back and are gunning to prove their claim that they were the greatest all-female punk band ever. Along for the ride are the B-52’s, who never broke up and never really went away (except from MTV). Rounding out the bill are the underappreciated Psychedelic Furs. Although this outing is trademark nostalgia (do any of them have a new record out? ), it also promises a real ’80s show that last year’s Culture Club reunion could only dream about. With a highly theatrical show and plenty of dancing, ‘N Sync looks to be the most expensive tour of the summer, but not because of ticket prices. Instead, parents will have to reach deep into their wallets to buy all the T-shirts, posters, buttons, coffee mugs, official programs, Frisbees and bottles of ‘N Sync sweat that their kids want. June 22: Kansas City, Mo. I’ll say this for Britney Spears: She is a machine. Her extensive tour of the U.S. is actually trying to reach every 13-year-old in America. In the process, Ms. Spears might sing and dance herself into a nervous breakdown, but she’ll at least have shown up all those neo-Dead bands that aspire to road-warrior status. June 23: Darien Center, N.Y.
July 7: Tinley Park, Ill.
July 16: Maryland Heights, Mo. July 17: Bonner Springs, Kan.
Aug. 5: San Bernardino, Calif.
Aug. 8: Mountain View, Calif.
Aug. 25: Atlantic City, N.J.
Aug. 30: Saratoga Springs, N.Y.
Sept. 10: West Palm Beach, Fla.
Sept. 14: Virginia Beach, Va.
For the majority of the last decade, Bob Dylan has been trying to make up for that eight-year period in the late ’60s and early ’70s when he refused to tour, and he’s really overdoing it. On their so-called Never Ending Tour, Dylan and his wickedly tight backing group have been reinventing his song catalog onstage, and throwing in some covers of folk/country standards and Dead songs. No surprise then that the Grateful Dead’s bassist Phil Lesh is slipping into the shoes of Paul Simon, who co-headlined a tour with Dylan last summer. Lesh will tour with an assortment of musical friends, including members of Little Feat. June 24: Mountain View, Calif.
July 1: Del Mar, Calif.
July 7: Bonner Springs, Kan.
July 8: Maryland Heights, Mo. July 15: East Troy, Wis.
July 23: Saratoga Springs, N.Y. The biggest hip-hop show of the summer is really the Dr. Dre show. All of the rappers here have benefited from Dre’s production genius and scored platinum sales as a result. This tour will feature solo sets by the rappers and possibly some collaboration onstage, including an occasional reunion of N.W.A., the godfather of gangsta rap, which featured Dre, Ice Cube, M.C. Ren, the late Eazy-E and D.J. Yella. (Snoop Dogg has agreed to slip into Eazy’s role in the reunion). But it’s Dre’s latest protege, Eminem, who might be the hit of the tour. His new record is No. 1 in the country and he’s MTV’s new foul-mouthed darling. June 15: Chula Vista, Calif.
June 16 and 18: Anaheim, Calif.
June 19: San Jose, Calif.
July 7: Auburn Hills, Mich.
July 8: Des Plaines, Ill.
After years of being forced off the road because of its feud with Ticketmaster, Pearl Jam is now playing several albums’ worth of material live. The Seattle band, with new drummer Matt Cameron (formerly of Soundgarden), is also older and wiser than when grunge was king. The long hair is gone but they prove that guitar rock is still kicking. Sonic Youth and Supergrass will open. Aug. 9: West Palm Beach, Fla.
Aug. 27: Saratoga Springs, N.Y.
What can you expect from the sixth installment of the Warped Tour? Punk rock and skateboarding, of course. Throw some tattoos and body piercing in there too. This year’s lineup includes Green Day, Long Beach Dub All-stars (formerly Sublime), NOFX, the Mighty Mighty Bosstones, Anti-Flag, Flogging Molly, Good Riddance, Hot Water Music, Jurassic 5, Lunachicks, Millencolin, MXPX, One Man Army, Snapcase, the Donnas, the Line, the Muffs, Suicide Machines and TSOL. June 24: Chula Vista, Calif.
July 2: Lake Tahoe, Calif.
July 12: Tinley Park, Ill.
July 16: Asbury Park, N.J.
July 17: Saratoga Springs, N.Y.
July 31: Panama City Beach, Fla.
For the first time since they hijacked Lollapalooza in 1996, Metallica is headlining a package tour, sort of. By including bands like Korn, Kid Rock, Powerman 5000 and System of a Down on the tour, Metallica boasts a stronger bill than if they toured alone, especially with Ozzfest. And looking at the bands that both tours assembled, Metallica took a majority of the big names in metal. And even if you’re not a fan, Metallica knows how to get your body shaking — with their amplifiers, if need be. July 16: Queen Creek, Ariz. Though Ozzy Osbourne is the ringmaster of this metal massacre, it is the headbanger-friendly theme and the stellar metal groups he assembles that keep fans coming. There have been hints that Ozzy will pull the plug on the tour after this year. July 2: West Palm Beach, Fla.
July 10: Virginia Beach, Va.
July 26: Saratoga Springs, N.Y.
Aug. 16: Kansas City, Mo. Aug. 26: Mountain View, Calif.
Sept. 2: San Bernardino, Calif. KISS has made themselves something of a road fixture since they reunited with Ace Frehley, Peter Criss and the makeup a couple of years ago. Though this has been proclaimed as the band’s final outing, do they really mean that this is the end? Who knows? You can bank on the fact that you will get arena rock from one of the bands that invented it. June 27-28: East Rutherford, N.J.
July 2: Virginia Beach, Va.
July 28: Mountain View, Calif.
As you might expect, this list is far from comprehensive. Other acts planning to fill a club, bar, theater or stadium near you include the Red Hot Chili Peppers, the Dave Matthews Band, No Doubt, Hanson, Limp Bizkit, Jimmy Buffett, the Dixie Chicks, Sting, ex-Pink Floyd mastermind Roger Waters, Phish, Marc Anthony and the Cure. In double-bill news, you can check out the Counting Crows/Live tour this summer. But the real monster of dual headliners will be a tour featuring a reunited Who (yes, again) and Led Zeppelin’s Jimmy Page and the Black Crowes. According to reports, the acts will tour together, sharing their road crews, but will alternate the days — the Who playing one night, while Page, backed by the Black Crowes, plays the next. And don’t forget about the latest American leg of Bruce Springsteen and the E Street Band’s tour (Bruce will wrap up things in New York City in early July). In other reunion news, Steely Dan and Yes are planning jaunts separately in June and July. On the horizon, Prince has hinted that he might tour before summer’s end, as has the Fugees’ Wyclef Jean. The Furthur Festival, featuring some of Phil Lesh’s Grateful Dead bandmates, might also make an appearance. The only problem is that with ticket prices hovering in the $30 range for most tours, you can’t see everything. The good news is that other reviewers and I will be attending many of these shows, and we’ll keep you posted on what really is worth seeing and what tours really should be their last. Tags: 'N Sync, 2000, Anti-Flag, Bob Dylan, Britney Spears, Crazy Town, Deadlights, Dr. Dre, Eminem, featuring Dr. Dre, Flogging Molly, Godsmack, Good Riddance, Hot Water Music, Ice Cube, Incubus, Jurassic 5, Kid Rock, KISS, Kittie, Korn, Long Beach Dub All-stars (formerly Sublime), Lunachicks, M.C. Ren, Metallica, Millencolin, MXPX, NOFX, One Man Army, Ozzfest, Ozzy Osbourne, P.O.D., Pantera, Pearl Jam, Phil Lesh, Pitchshifter, Powerman 5000, Primmer 55, Pumpjack, Queens of the Stone Age, reen Day, Santana, Slaves on Dope, Snapcase, Snoop Dogg, Soulfly, Static-X, Suicide Machines and TSOL, summer, System of a Down, Taproot, the B-52's, the Donnas, The Go-Go's, the Line, the Mighty Mighty Bosstones, the Muffs, the Psychedelic Furs, The Up in Smoke Tour, Tommy Lee's new band Methods of Mayhem, tour, tours, Warped Tour. Bookmark the permalink.